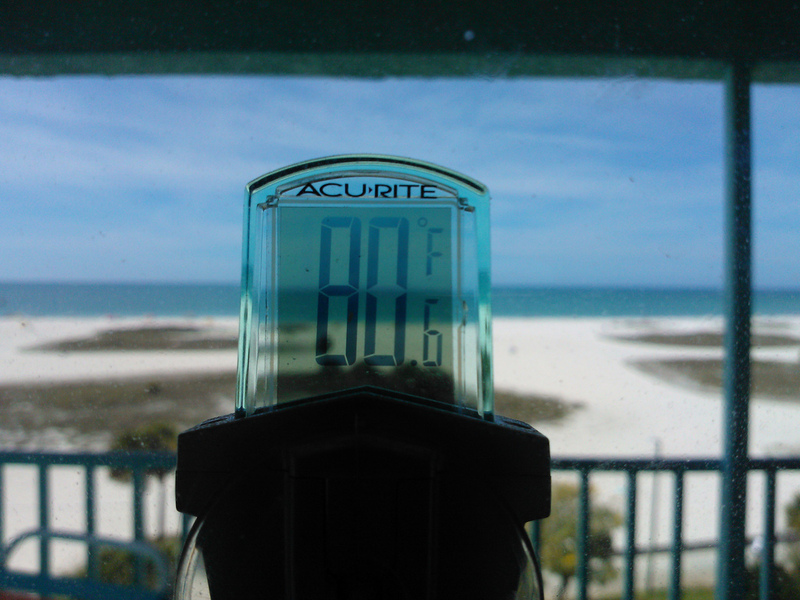 We’re back from a week away in Florida spent with my parents in their condo on the beach near St. Petersburg. I never pictured myself a Florida-traveller, and it’s still not a suit of clothes that’s entirely comfortable, but a mid-winter break in warm climes well-equipped with waffles and iced tea has its attractions. We flew down to Florida via United (it was originally a Continental reservation, but then, Continental became United just before we flew) from Halifax, which had the advantage of being cheaper ($1639 all-in for the 3 of us) and less labour-strife-stricken than Air Canada. We had a 2 hour stopover in Newark, New Jersey each way, which turned out to be rather pleasant due to excellent food court in Terminal C (hamburgers at Smashburger, coffee from Juan Valdez, juice from Jamba — all run-of-the-mill to Americans, but exotic for us). Because we were arriving after midnight at Tampa International we took a limo to the condo, booked in advance from SuperShuttle ($65 one-way); our town car driver was at the bottom of the escalator when we arrived 30 minutes early, and was quick and friendly. The SuperShuttle website has a cool “where’s my car?” feature and my mother was able to follow along on her laptop as we neared the condo. We spent out week in the sun doing all manner of things: we visited Winter the famous dolphin in Clearwater, the Museum of Science and Industry in Tampa and the Dali Museum in St. Petersburg (an unexpected treasure). We ate well, had fun scrounging for good coffee, swam in the pool, and enjoyed the company of my parents. And then, suddenly, it was time to come home: we booked a van from SuperShuttle to arrive at 5:30 a.m. on Friday morning; our man was there at 5:15 and got us to the airport by 6:05 a.m., leaving us plenty of time to clear security, have breakfast and make our 8:00 a.m. flight. The flight back had DirectTV service which was pricey at $7.99 per person for the flight, but I used the “do anything you possibly can, no matter the cost, to make flying less stressful” approach and so Oliver watched 2 hours of Phineas and Ferb while I watched Contagion (which, confusingly, switched to New Year’s Eve halfway through — why did everyone suddently get healthy?!). After another meal in Newark Airport and a quick (albeit TV-less) flight to Halifax, we were in the car and headed home at 4:30, and pulled into our driveway in Charlottetown, after supper at Bella’s in Amherst, around 10:00 p.m. Written March 25, 2012 at 3:58 p.m. The Dali museum in St. Petersburg has been the highlight of my time in Florida. 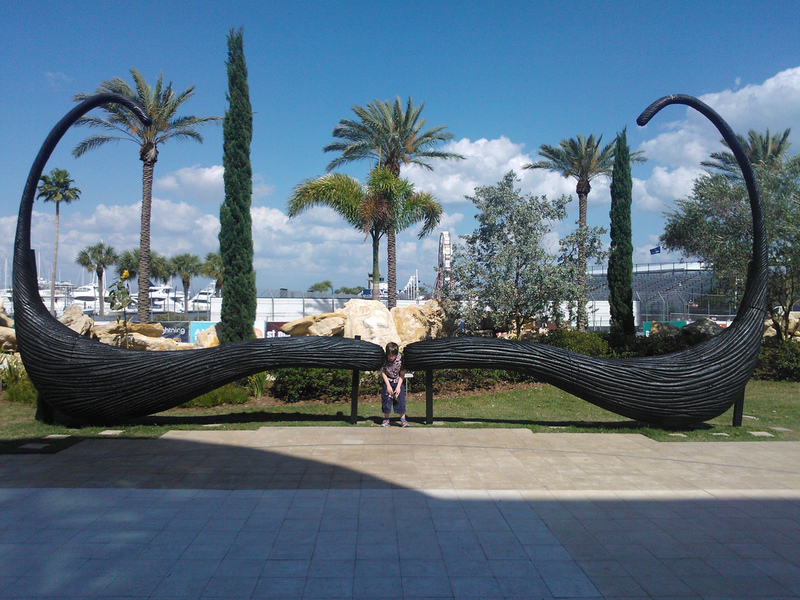 I am not a big fan of the “Florida Experience” (TM) but I have been very happy at the Dali museum.